Android's SDK offers an emulator that, among other things, lets you use the browser. 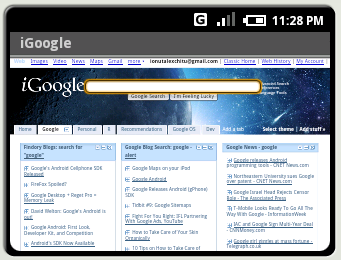 Google used WebKit, an application framework that also powers Safari and Nokia's S60 browser. 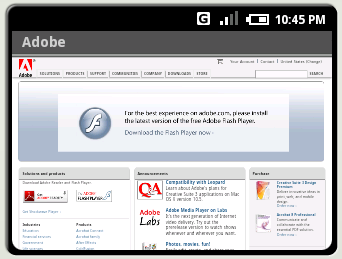 Android's browser does a good job at rendering complex web pages, but it doesn't have Flash support and it's really slow. You can zoom in, zoom out and move inside a web page. 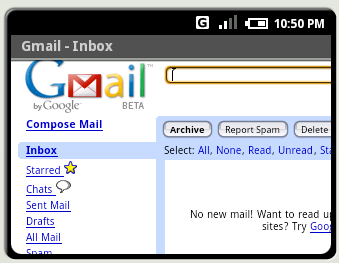 Here are some popular web sites rendered by an early version of Android's browser. I would like to have the option to opt for mobile optimized version. Sometimes you really just want to do something quick (re-read your email?) and you don't really a full interface for that. io, you show your email on the last screenshot! @Mark: Opera Mini is very good, but I don't like that you have only two levels of zoom. 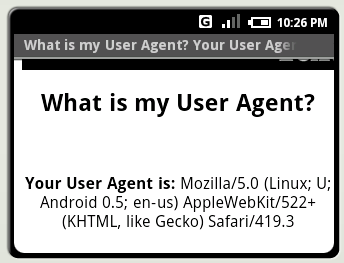 Also, Opera Mini is just an interface to Opera Mobile running on a server. 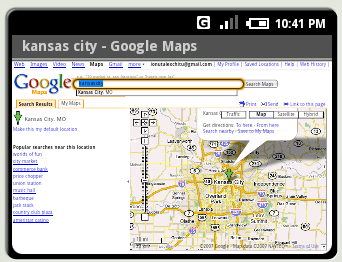 @Dmitri: You can see the mobilized version of a page here: http://google.com/gwt/n or by searching at Google Mobile. Note that this is a linear version, not the one from Android's browser. I think Google should create a mobile version of these pages like the iPhone adjusted web pages, looks much better. Otherwise seeing a webpage by panning and moving up and down for every page will become tedious. how can i run that emulator? Download the SDK, the plug-in for Eclipse and run one of the sample apps. "Android's browser does a good job at rendering complex web pages, but it doesn't have Flash support and it's really slow." Serious that really cool features. Just can't wait to get a Android Enabled phone. hmm... i was wondering if they offer a google mobile web browser as a standalone application? Can I run the android browser on my desktop? Regarding: "Speed issues are likely to be caused by the use of an emulator"
I use an Android phone (not an emulator) and the browser is extremely slow - I've had this experience even using a WiFi connection. I would think that correcting this should be high on Google's list of priorities. Regarding Android Browser speed, I switched to WiFi and restarted the phone and that solved the speed problem. The Android browser still seems slower than other phones on my ATT wireless connection, but that could be due to my heavy usage and a need to restart the phone now and then (?). The Anderoid browser in my new HTC Magic can not handle my most important homepage URL http://www.poseidon.hcmr.gr. It is a weather forcast page for the mediterranean. 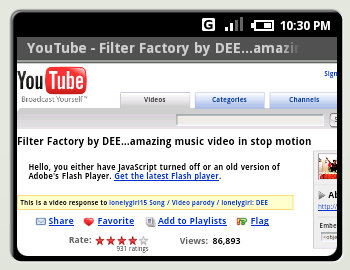 Opera Mini can handle it quite well in my HTC magic. I guess there are a lot more of URL:s with multiple frames that not can be viewed in Anderoids browser. still i have not met anyone that can not be opened in Opera mini !!! 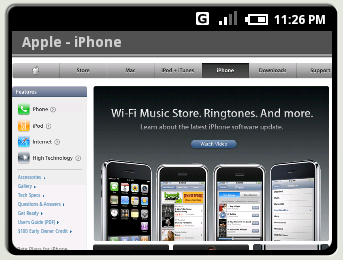 the version of android that have been use and the webkit version . my brother complains the browser just uses htmlviewer and see plaintext when opening xls or doc file while from gmail it recognizes those files and use the appropiate app. This can present a problem, if a busines like him needs to open the office web mail, the android web browser cant open those attachments correctly. 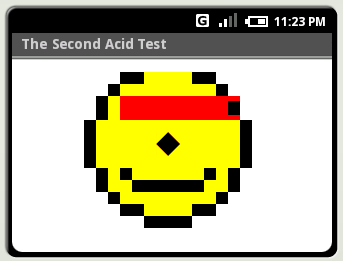 Google Android viewer is not compatible with IDN. Shame, shame on Google. Google, u need too send me my token password so i can check my balance with chase bank, why would u do such a thing and not notify people of your changes, at least notify us the masses, that use cricket and u r the mobile browser, get it together.